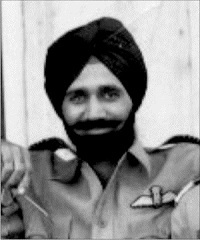 Wing Commander Harsern Singh Gill was born on 6th July 1933 in the family of Shri Pooran Singh Gill in Bareilly in Uttar Pradesh. He was married to Ranjeet Gill and had a son named Shahbeg Gill. On October 1953, a composite column of Assam Rifles and a Civil administrative party was attacked by armed Tangins and some officers and men were killed in the attack. H.S. Gill then was the commanding officer of detachment of Dakotas for the air landing of troops who were required to tackle the situations there. The work of air landing personnel and supplies on two small available landing grounds was highly difficult and risky. Notwithstanding the difficulties, Gill with his keen enthusiasm and boundless energy carried out the major portion of landing at Doporijo. By his tireless work the aircraft landing which had appeared impossible became a reality. He showed his courage and devotion towards the duty of the highest order for which he was awarded Vayu Sena Medal. He was one of the 47 Squadron “Black Archers” based in the western sector. During the operations against Pakistan in December 1971 , Wing commander H.S.Gill was commanding fighter Squadron in the western sector. He led several operational missions on air defence , close support and counter air operations during the period of 3rd to 13th December. Close air support operations are meant to minimise or clear the impediments in the way and vicinity of our soldiers to defeat the adversaries and take hold of the tactical and strategic locations. The aircrafts strike the enemy concentrations and cripple their equipment to pave the way for our soldiers to move ahead and capture them with less difficulty. He set an inspiring example to all his pilots with his fearless approach , flying skill and dedication to his duties. 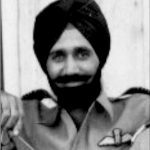 His squadron shot down one enemy F-104 air craft over Jamnagar and hit another F-104 aircraft on 11th and 12th December 1971, respectively . Disregarding his personal safety he took over the strike missions over the Badin signals unit complex in the face of intense enemy Anti Aircraft fire .On the 13th December 1971 , he undertook another strike mission on the same target . During this attack his aircraft was attacked and shot down by enemy Anti-Aircraft fire. Throughout these operations, Gill displayed extreme courage,tenacity, leadership and professional skill of a high order for which he was awarded with Vir Chakra. 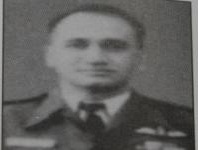 During the operations against Pakistan in December, 1971, Wing Commander Hersern Gill was commanding a Fighter Squadron in the Western Sector. He led several operational missions on air defence, close support and counter air operations during the period from 3rd December, 1971 to 13th December, 1971. He set an inspiring example to his pilots with his fearless approach, flying skill and dedication to his duties. 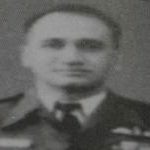 His Squadron shot down one enemy F-104 air craft over Jamnagar and hit another F-104 aircraft on 11th and 12th December, 1971, respectively. Disregarding his personal safety, and with great courage and skill, he undertook strike missions over the Badin Signals Unit Complex in the face of intense enemy Anti-Aircraft fire. On the 13th December, 1971, he undertook another strike mission on the same target. During this attack his aircraft was shot down by the enemy Anti-Aircraft fire. Throughout these operations, Wing Commander Hersern Singh Gill displayed gallantry, leadership and professional skill of a high order. This tribute is very small in front of the exemplary courage and grit shown by our brave Wing Commander H.S Gill. It is because of people like him that we feel proud to call ourselves Indian. We can never imagine let alone even tolerate the torture and suffering our brave hearts go through when they are captured by enemies. Thank you for inspiring me and for fighting for our safety. You put your lives at risk for us and your tenacity to tolerate the torture and still not spill out valuable information is commendable. You are the true celebrities of India and deserve the most noble award, best facilities for housing, for your family and highest salary. We salute you and you will always be alive in our hearts. We promise to put our best effort in completing the mission for which you so valiantly laid down your life. We will fight terrorism till our last breath. Our condolences to your family. They have not only lost their son, brother, husband, nephew or father but the whole nation has lost a son- a veer jawan whom we are proud to call- Martyred Wing Commander H.S Gill.